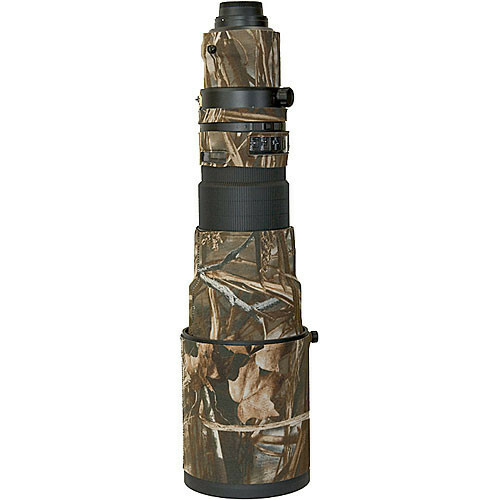 The Realtree Max4 Lens Cover for the Nikon AF-S Nikkor 500mm f/4G ED VR II AF Lens from LensCoat is a 100% closed-cell neoprene coat that protects the lens from bumps and scratches. It is useful for nature and outdoor photographers, as well as sports shooters and photojournalists. It provides a thermal barrier, protecting your hands from cold lens surfaces in lower temperatures. The cover is waterproof, providing protection to the lens in wet conditions. The LensCoat Lens Cover is easy to install and remove, leaving no residue on the lens. This cover can help you preserve the resale value of the lens by protecting it from dust, dirt and other contaminants. The Realtree Advantage Max4 pattern offers effectiveness in open terrain. The pattern features cattails, millet, milo, corn stalks, sunflowers, oak and maple leaves, cedar and oak limbs, plus a variety of other plant life. Box Dimensions (LxWxH) 7.6 x 6.7 x 1.4"
Lens Cover for the Nikon AF-S Nikkor 500mm f/4G ED VR II AF Lens (Realtree Max4 HD) is rated 4.5 out of 5 by 22. Rated 3 out of 5 by NOVA Photog from Needs Improvement I was going to get the lens cover anyway, to avoid getting divots in my 500mm when I inevitably whack it against something. I like the camo, and any product that makes me look dorkier to the general public is a must-buy for me. The cover actually looks ok, wildlife doesn't flee at the sight of it, and the general public has responded with favorable commentary rather than ridicule. But... Is no one at LensCoat able to cut the neoprene in a straight line? Pieces look like they were cut freehand. Not very inspiring. Also, the poor fit of the front piece covers the focus operation bottons at the front of the focus ring; who thought this was a good idea? There are clear plastic windows for the various other buttons, but not for this? Also, was it really impossible to have a section that covered the focus ring? All in all, a decent product idea let down by poor execution. Way overpriced for the quality, but still the only real item in its class for someone who's not a dedicated do-it-yourselfer. Would I buy it again? Maybe, but with low expectations and I'd grit my teeth while doing it. Rated 4 out of 5 by Martin from Good camouflage but not essential The fit reminds me of my lenscoat for the 300 F2.8. You have to get it adjusted so that the focus ring moves easily with no touching. Fortunately this is not hard. The filter pop out draw access is not something I use so it doesn’t matter that is now much harder to access. The function buttons on the lens disappear but I know where they are and they still work OK. This cover is a good way to protect the lens but is also useful as camouflage. It makes this massive lens look slightly less daunting. I like it. Rated 4 out of 5 by Beverly from excellent protection Great protection for my lens. It is well fitted, although it does cover the AF-on buttons located on the lens. Rated 5 out of 5 by Robert from GOOD PROTECTION AGAINST SCUFFS AND NICKS I am very satisfied with the construction of the product. It certainly can add value to your lens if you ever want to sell it.With this cover on your lens will always look like new. It is a bit cumbersome to install ( you have to remove the tripod foot) but once you have it on it makes for a great protection. Rated 4 out of 5 by beltsazar from almost perfect great material, great padding. imo, the cons are.. no cover for focusing ring (but it's already shown in the pic). and it blocks some important marks on the lens. (VR on/off and tripod collar). and i also hate the clear plastic that cover my af limiter. somewhat little bit annoying. Rated 5 out of 5 by Anonymous from Does the Job!! I use the product primarily for protection of the lens. Fit was good. No real negatives, except maybe little pricey. Great camo for those who desire that also. I use on all my more expensive lenses, sure helps preventing nicks, etc. when you bang into something accidently. Rated 5 out of 5 by Anonymous from Great fro Wildlife Photographers I use camo lens covers on all my long lenses. It is the first thing I buy after the lens. Not only do they protect the lens, but they may also prevent an unwanted glare at that critical moment when you are about to capture a great shot.